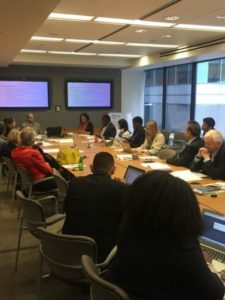 On October 7, 2016 the Partnership for Transparency Fund (PTF) co-sponsored a panel at the World Bank’s Civil Society Policy Forum entitled “Civil Society and Development: Six Global Trends and Lessons from Nigeria.” PTF, along with the Africa Middle East Progressive Initiative (AMEPI), presented PTF’s newly released report on Global Trends in Civil Society Engagement and what those trends mean for Nigerian CSOs. Vinay Bhargava, Chief Technical Officer at PTF, introduced PTF’s report on “Civil Society & Development: Global Trends, Implications and Recommendations for Stakeholders in the 2030 Agenda,” which examined what civil society is currently doing, what they want to do, and what they are capable of, in the context of the 2030 Agenda Sustainable Development Goals (SDGs). Sarah Little, Programs and Communications Manager at PTF, gave an overview of the six global trends of civil society engagement identified in this report. She explained that there are two parallel – but ultimately conflicting – trends in the varied space for civil society engagement (Trend 5). While many governments and international government bodies have displayed new commitments to openness and increased citizen engagement, there is a negative trend of countries limiting CSO and civil society engagement through stringent registration requirements, restricted access to funding, and limitations on freedom of association and assembly. Vinay Bhargava presented PTF’s recommendations stemming from these findings for the four groups of associated actors. The common theme for governments, the World Bank, philanthropies, and CSOs was increased partnership and engagement on all sides. While improving laws and policies is a necessary step, implementing these approaches is more vital and will have a longer term impact. The presentation then turned to Amidat Hassan, Co-Founder of AMEPI, to discuss the implications of these findings in Nigeria. The Nigerian government, in partnership with AMEPI, is already implementing some of the suggested changes. Ms. Hassan identified the partnership with the Ministry of Agriculture as a particularly successful example. The Ministry has programs to support civil society in providing seeds and other starter kits to CSOs, but many citizens are unaware of the help the government can provide. AMEPI helped run an information campaign to inform civil society of what they were entitled to and how to go about participating in the programs. Mr. Steven Shalita of the World Bank then spoke about current and planned Bank programs in Nigeria. Both the Nigerian government and the World Bank have reaffirmed their commitment to increased Civil Society engagement and it is now time to make sure these ideas are implemented. Mr. Shalita suggested that a sustainable way of ensuring results was to move to a structured way of engaging CSOs with CSOs and the Bank holding each other accountable. Ms. Amy Ekadawi, BIC, then led a lively discussion with the 40 participants from the World Bank, Civil Society Organizations, and other international institutions.